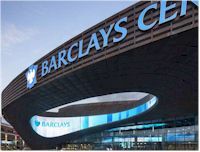 Barclays Center opened in 2012 to showcase the world�s most thrilling entertainment and sports events right in the heart of Brooklyn, New York. Barclays Center serves as the new home of the NBA�s Brooklyn Nets and boasts one of the most intimate seating configurations ever designed for a modern multi-purpose arena. Approximately 18,000 seats with unparalleled sightlines are ready to welcome sports fans to the action and audiences of up to 19,000 can be accommodated for musical performances. The arena�s 101 luxury suites, four bars/lounges, three clubs and the newest location of Jay-Z�s 40/40 CLUB & Restaurant all guarantee that an event at Barclays Center is destined to be a memorable one. In 2015, it will become the home of the NHL's New York Islanders. Located within Barclays Center is the Cushman & Wakefield Theater, an intimate theater perfect for theatrical performances, small venue concert artists, music festivals, boxing events and comedy acts. The Barclays Center is one of the top New York City venues for concerts and other events. Don't miss some of the biggest names in music as they come to New York City area's Barclays Center to perform live.